What is e-prescribing or e Prescription Software? e-prescribing is defined as “the computer-based electronic generation, transmission, and filling of a prescription, taking the place of paper and faxed prescriptions.” With an aim toward improving the quality of patient care, e-prescribing gives healthcare providers the ability to send prescriptions electronically from the point of care directly to the patient’s pharmacy. Providers can typically select from several medication options, including generic alternatives to brand-name drugs. When the patient’s insurance information is available, formulary options may also be included. Prescriptions can be conveniently created on a provider’s desktop or mobile device and sent directly to the patient’s pharmacy. Most systems offer a confirmation of prescription receipt and the ability to manage more than one prescription at a time. To prevent adverse interactions, e-prescribing software provides an alert if a prescription is considered a potential hazard for some reason. This could be due to issues such as drug-drug interactions, medication duplication, patient allergies, and dosage amounts outside of recommended ranges. When a patient needs a refill on a prescription, the pharmacy can send the request directly to the provider, who can then approve or deny the refill electronically. Through a variety of methods—such as the pharmacy’s database, insurance claims for medications, or the electronic medical record—providers are typically able to access a view of the patient’s medication history to aid them in prescribing decisions. 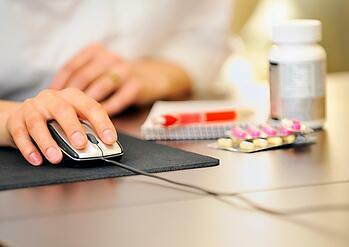 Sending controlled substance prescriptions electronically and securely directly to the pharmacy. Making informed decisions for patients who may be at higher risk of abuse. Ensuring compliance with existing regulations. Receive messages about medication adherence. View the patient’s adherence summary. Respond to Medication Management messages. According to the Agency for Healthcare Research and Quality (AHRQ), adverse drug events (ADEs) account for nearly 700,000 visits to the emergency department and 100,000 hospitalizations annually. The agency reports that nearly five percent of hospitalized patients experience an ADE and say that rates may be even higher in ambulatory care settings. Although adverse drug events may occur due to a variety of reasons, AHRQ estimates that about half are considered preventable—including medication errors. Historically, such errors have often been linked to some failure within the traditional paper pathway of prescribing, transcribing and filling/dispensing prescriptions. The paper-prescribing framework is fraught with an array of potential errors due to lack of access to the patient’s complete record, illegible handwriting, inconsistent ordering formats, and lack of alerts for allergies and interactions, among others. For reasons such as these, improved patient safety is one of the greatest benefits of e-prescribing—which is why the AHRQ recommends the use of computerized provider order entry (CPOE), which incorporates e-prescribing software. Patients and families do not have to keep track of paper prescriptions, deliver them to the pharmacy and wait while they are filled. Instead, the order is transmitted directly from the point of care and the pharmacy can notify the patient when the prescription is ready for pick-up. Such convenience also supports medication adherence. Providers have everything they need at their fingertips. Instead of creating paper orders in a silo, they are provided with access to the patient’s medication history, options for medication selections that optimize care and reduce costs, safety features to prevent ordering errors, and the convenience of ordering from electronic platforms that can be accessed either on a desktop or from a mobile device. Pharmacy staff can work more efficiently and with the assurance of greater accuracy since they don’t encounter illegible handwriting and orders that aren’t clear—which would require provider call-backs for order verification. e-prescribing helps to reduce healthcare costs for a variety of reasons. These include provider access to more cost-effective options when selecting medications, the reduction of medication errors which may require additional care, and the overall optimization of care quality—which reduces the need for ongoing intervention. Several federal regulations have had a major impact on the growing momentum of e-prescribing in all patient care settings. The Health Information Technology for Economic and Clinical Health (HITECH) Act of 2009 proposed “that healthcare professionals throughout the United States have access to EHRs and use them meaningfully according to standards set by the Centers for Medicare and Medicaid Services (CMS).” In that context, the intent of “meaningful use” was to show how technology was being used to improve patient care—and e-prescribing was an important way to do it. In 2011, CMS established the Medicare and Medicaid EHR Incentive Programs “to encourage Eligible Professionals EPs, eligible hospitals, and CAHs to adopt, implement, upgrade (AIU), and demonstrate meaningful use of certified EHR technology (CEHRT).” As an essential tool within EHR systems, e-prescribing software continued to contribute to the demonstration of meaningful use. Although the framework for meaningful use has changed with the implementation of MACRA, it is still an essential component of optimizing patient care. HealthIT.gov notes that within the MACRA model, meaningful use “was transitioned to become one of the four components of the new Merit-Based Incentive Payment System (MIPS), which itself is part of MACRA.” As an integral part of meaningful use, e-prescribing continues to play a critical role in helping providers optimize the quality of patient care and embrace the financial rewards of doing so within this new value-based payment system. There are two types of e-prescribing systems available to providers: those which stand-alone, and those which are integrated into EHR software. Stand-alone systems are less costly and may be an attractive option for smaller practices, but they are more limited in terms of access to patient information and tools that support clinical decision-making. e-prescribing software that is integrated into an EHR platform is typically more expensive, but offers access to a comprehensive patient record and is supported by an array of functionalities geared toward optimizing patient care. PrognoCIS embraces the growing need for e-prescribing capabilities for stakeholders across the care continuum and the many related benefits that improve care quality and reduce costs and therefore offers RxHub as a feature to providers enrolled with Surescripts for e-prescribing. Send a prescription directly to the pharmacy. Refill a prescription from the mobile app. Make the most of Clinical Direct Messaging functionality, through which updated patient information is securely exchanged across all care settings while meeting current and future standards for Meaningful Use. PrognoCIS EHR is now certified with RxChange and CancelRx by Surescripts, which allow physicians and registered pharmacies to communicate through electronic messages, instead of the less efficient fax or telephone-based communication. If a pharmacy receives a prescription and they have an equivalent drug rather than the exact one prescribed, they can use RxChange to request a change to the doctor’s written prescription. Doctors can use CancelRx when they’ve sent a prescription electronically and need to cancel it, such as when a patient gives the doctor new information about their symptoms that influence a change in strategy. Through PrognoCIS EHR, providers can use EPCS to prescribe DEA-class drugs electronically. PrognoCIS enables users to seamlessly and securely transmit e-prescriptions to pharmacies for DEA class I, II, III, IV, and V. The feature enforces two-factor authentication for prescription of narcotic drugs to ensure that drugs are not prescribed by unauthorized employees like medical assistants, nurses or administrative staff. 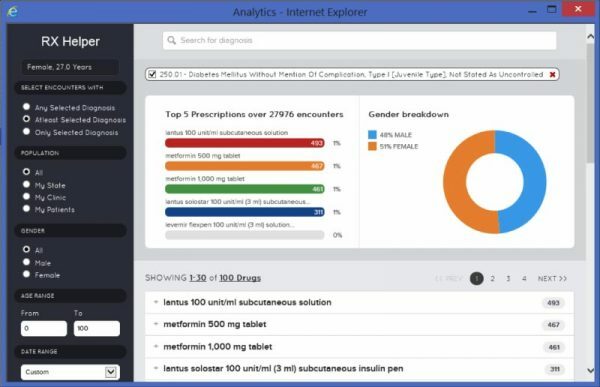 PrognoCIS, as well as Surescripts, keeps track of every prescription for auditing purposes. It then makes those prescriptions available as part of a patient’s medication history, regardless of where and by whom the prescription was given. 71%—of the U.S. population were in the Surescripts master patient index. 26%—increase in transactions delivered through the Surescripts network. 13%—increase in connected healthcare professionals. 59%—increase in the number of prescribers enabled for EPCS. 35%—increase in the number of medication histories delivered. “Real-Time Prescription Benefit delivers patient-specific drug benefit and cost information directly from PBMs to the e-prescribing workflow at the point of care, including up to five therapeutic alternatives. Surescripts reported that both options were very popular with providers and anticipates rapid adoption in the year ahead. Use of Codified Sig to reduce variances in the Sig-writing process and improve clarity in provider directions to patients. Refinement of drug descriptions to reduce variations and inconsistencies by adopting the ePrescribing Names (EPN) from the drug compendia. Increased use of RxChange transactions to enable the automation of the medication adjustment process. Increased use of CancelRx transactions to increase quality, safety, and reduce costs. Increased use of EPCS to reduce the abuse of controlled substances, fraud, and drug diversion. A growing number of state mandates requiring the use of EPCS are adding momentum to this process. In our rapidly changing world of healthcare, e-prescribing capabilities are not luxuries anymore. Increasingly, they are the essential tools you need to provide the highest quality of care for your patients, meet regulatory requirements, and optimize efficiencies within your practice. If you would like to learn more about how our offerings can meet your e-prescribing needs, contact us today for a free demonstration.